A short and (literally) sweet post for you all today: I’m sharing my latest strategy to make weekday mornings less awful. Just a little Sunday afternoon effort, and you’ll end up with a week’s worth of hearty breakfasts, waiting to be zapped in the microwave — perfect for all of us who love breakfast but hate mornings. As much as I feel the need to eat a filling breakfast every day of the week, I would hate to actually get up early enough to make meals from scratch every weekday before work. My last seven years of gradstudenthood and sleeping in have left me hopelessly slow in the mornings, and it’s not just a matter of caffeine intake, but of time. 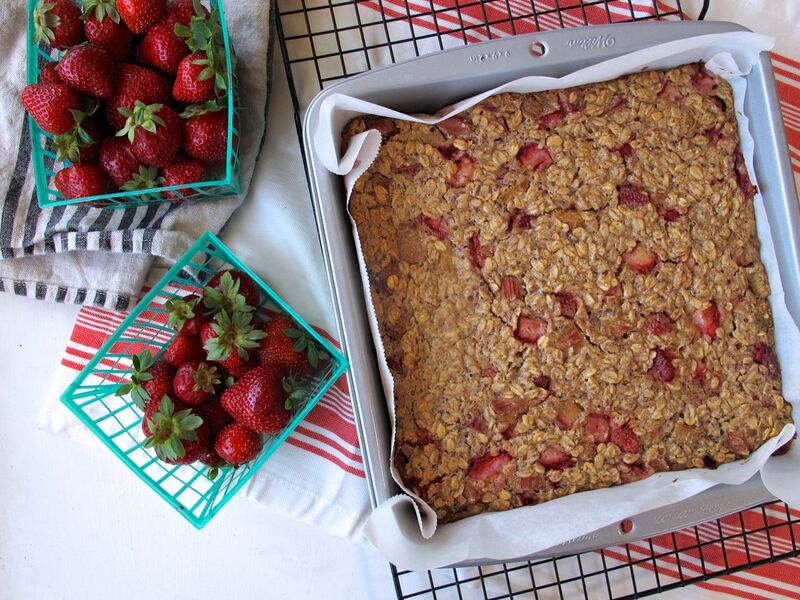 That’s where make-ahead breakfasts come to the rescue. For months, Paula and I made a giant 12-egg frittata every Sunday, and sliced it up for weekday breakfasts, but (believe it or not) you can only eat so many frittata slices before you start craving some variety. 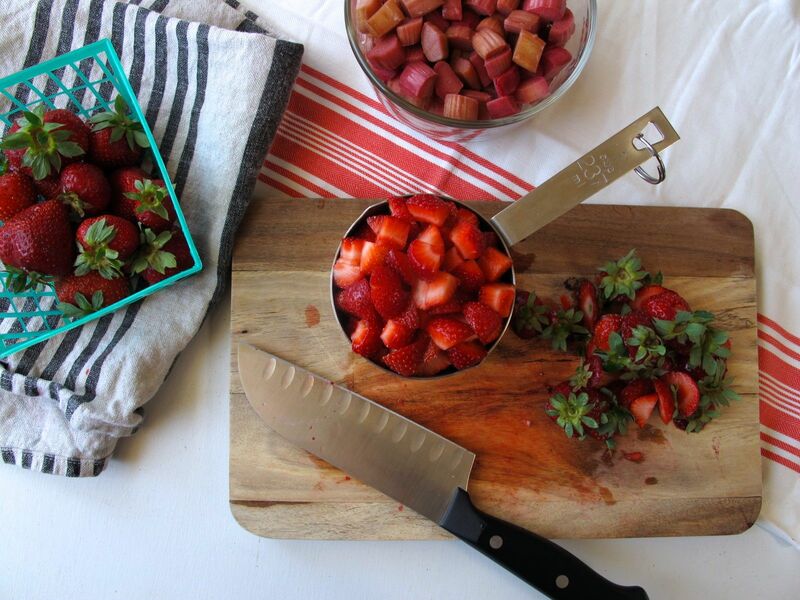 We started out making it with diced apple and blackberries, often adding raspberries and/or blueberries, too. So this strawberry rhubarb version is just one variation, but I am such a sucker for rhubarb, it’s probably my favorite one yet. 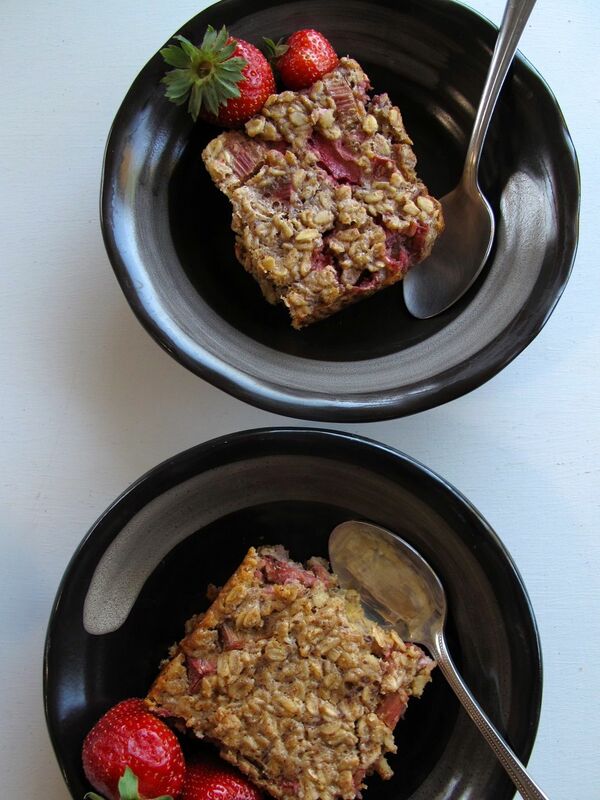 The re-heated squares of baked oatmeal, adorned with a drizzle of maple syrup or a dollop of yogurt, are not just time-savers on weekday mornings; they might almost make you forget that it isn’t a weekend. Active time: 20 min. ; Total time: 1 hour 15 min. e.g., try 1 finely diced apple + about 2 cups blackberries or raspberries. 1. 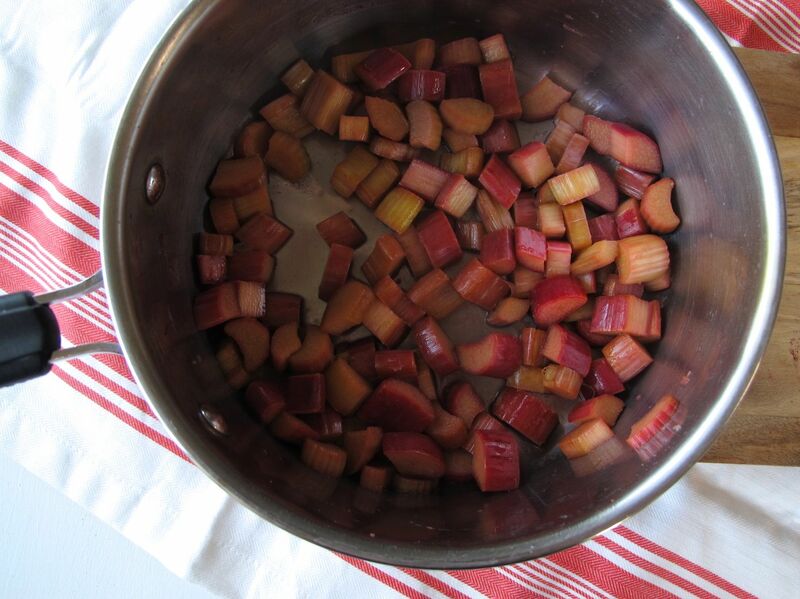 If using rhubarb, briefly pre-cook the rhubarb (can be done 1-2 days in advance): In a medium saucepan, combine chopped rhubarb, lemon juice, and sugar, and cook over medium-low heat for 15 minutes, stirring occasionally. 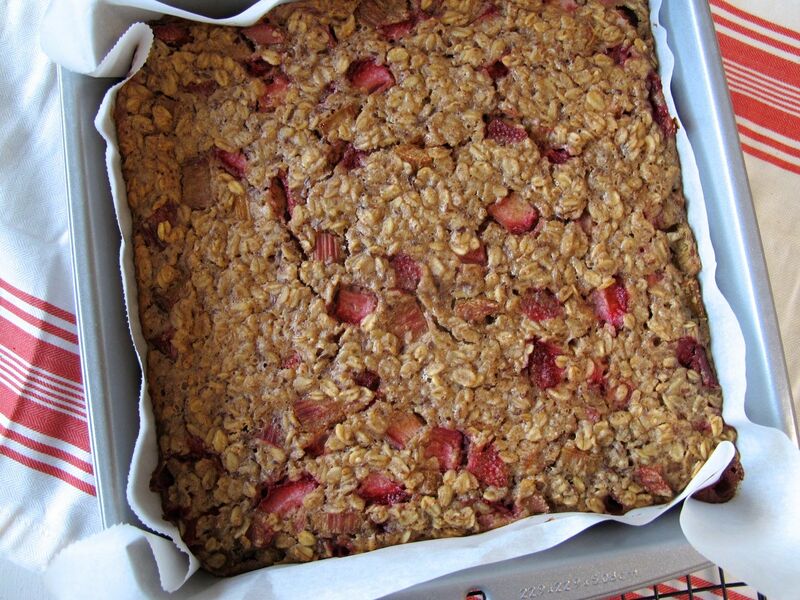 Set aside (or refrigerate for up to 2 days). 2. Line a 9-inch square baking dish with parchment paper. Position a rack in the top third of the oven and pre-heat to 350 degrees. 3. 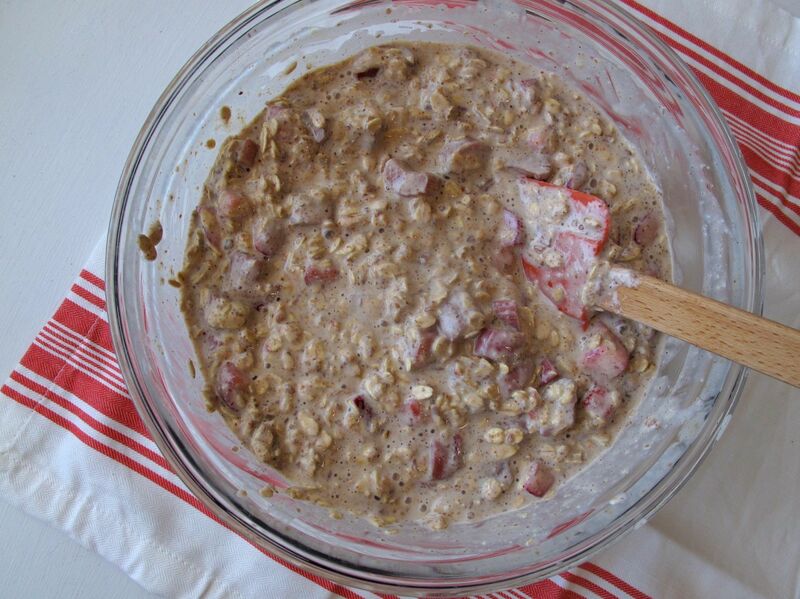 In a large mixing bowl, combine oats, baking powder, baking soda, salt, and cinnamon. 4. 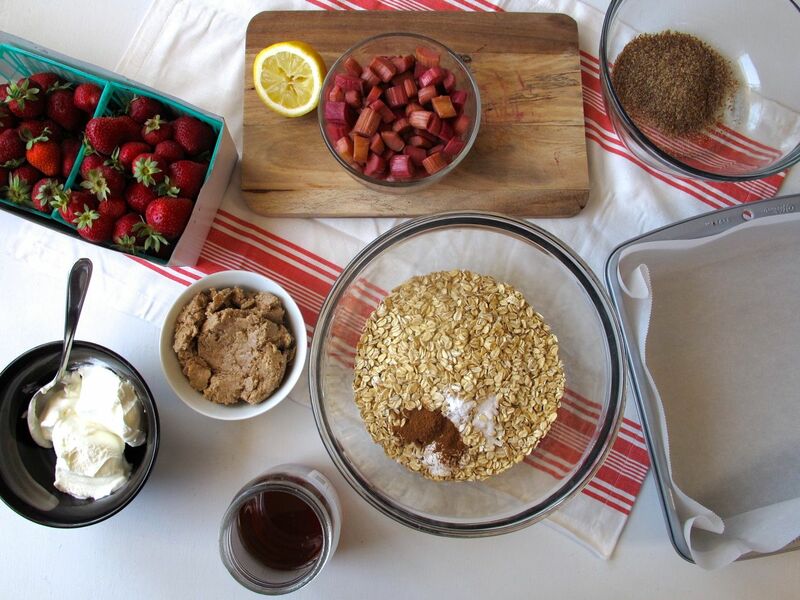 In a small mixing bowl, make two flaxseed “eggs” (which will help bind the ingredients together) by combining the ground flaxseed and warm water; stir and let sit for at least 3 minutes. Then mix in the almond butter, until smooth and clump-free. Then, one at a time, mix in the honey or agave/maple syrup, then the Greek yogurt, then the milk. 5. 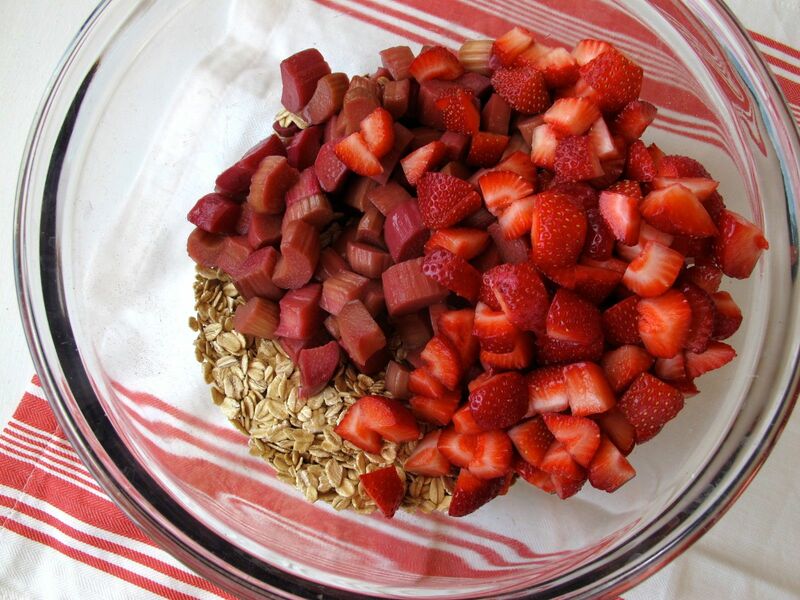 Add the wet ingredients to the dry ingredients in the large bowl, mix well, and gently stir in the strawberries and the pre-cooked rhubarb (or whatever fruit you’re using, like 1 diced apple + 2 cups berries). 6. Pour the mixture into the parchment-lined baking dish, and smooth the top with a rubber spatula. Bake for about 50 minutes until lightly browned on top. 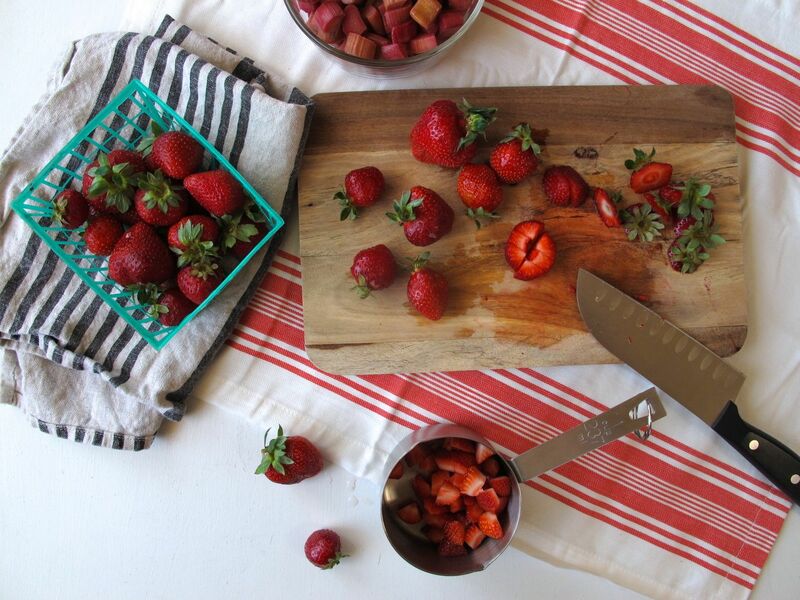 Let cool at room temperature before covering and refrigerating. 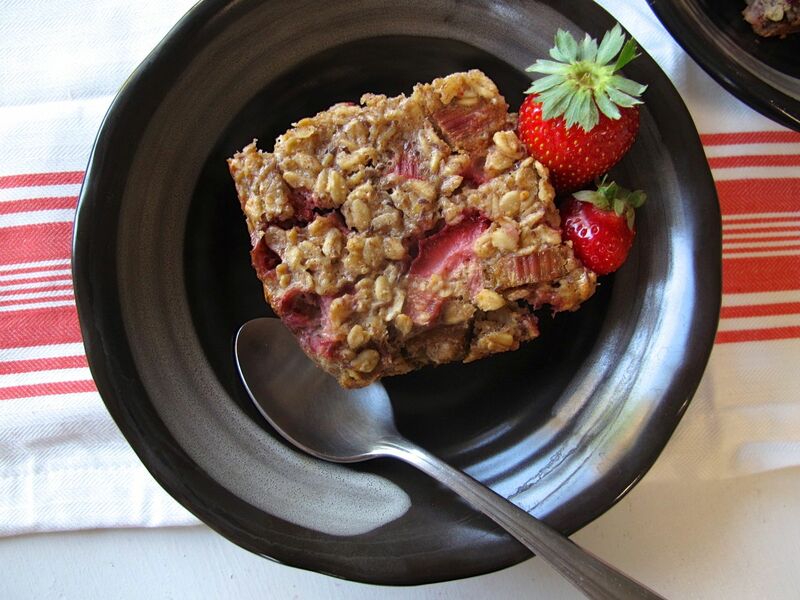 It will last one week in the fridge; re-heat squares of oatmeal in a microwave, and optionally top with a drizzle of maple syrup or a dollop of yogurt. Yum this is beautiful. It’s my favorite kind of dessert/breakfast. 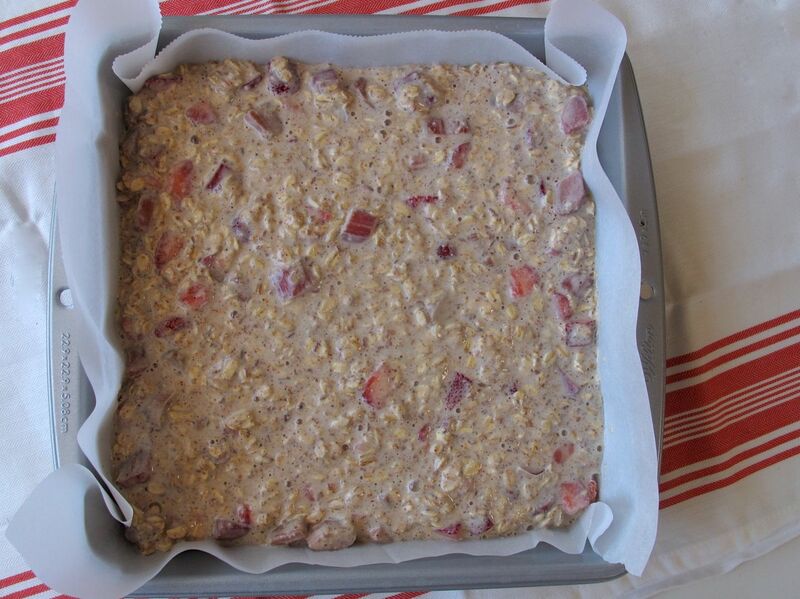 I love the tart/sweet combo and the oats. So fresh and delicious. I actually can’t be around this kind of dessert, b/c I have no off button. Thanks, Amanda! I really don’t think of it as a dessert — the fruit is always sweet enough for me that I don’t add maple syrup (Paula does, though), but it’s really no sweeter than any bowl of oatmeal + fresh fruit, since there’s so little honey in it. 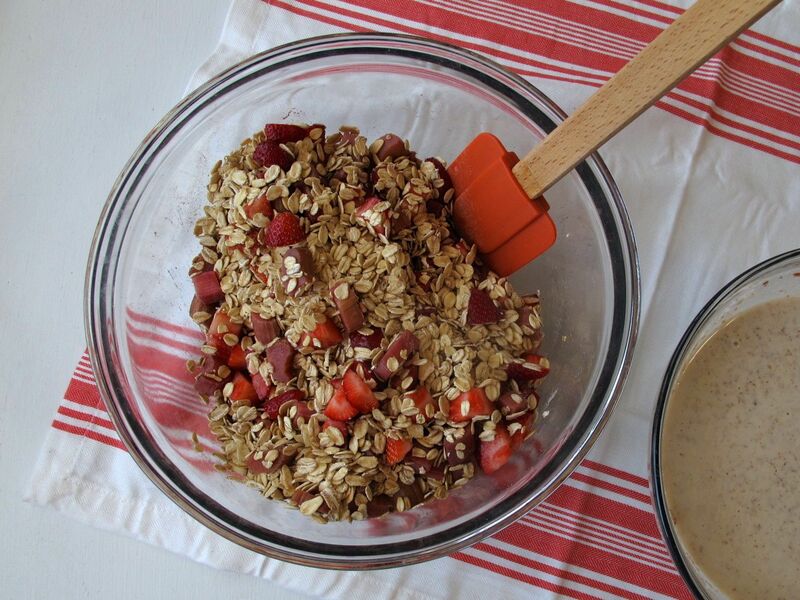 Fabulous idea for breakfast! I bet our kids would love this. Hey Em! That actually sounds good to me — just like a soft bowl of freshly made oatmeal, which I have learned to like now that Paula makes it for us sometimes (even though I don’t think I ever had oatmeal before I met her — growing up the only porridge-y thing I ever tried at home was Wheatina!). 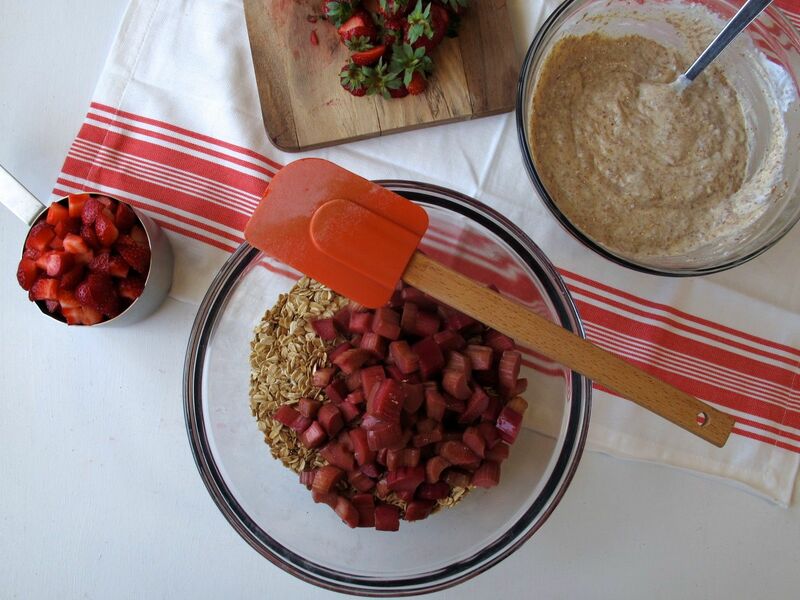 Anyway, sounds like a good use of rhubarb, and a good use of the “porridge setting” (!) on your rice cooker. The super cheap rice cooker that I have now (which I never use) only has 2 settings: “on” and “keep warm”… yours sounds fancy, though! Yeah, I had some free amazon points and decided to use them on a fancy rice-cooker. I’ve never used the porridge setting though and have been looking for an excuse. I had one from target that was more than 10 years old (though still worked ok), but it didn’t make brown rice well, and as I now realize, didn’t make other rice that well either. It has really helped the bento making too! Thanks for commenting! 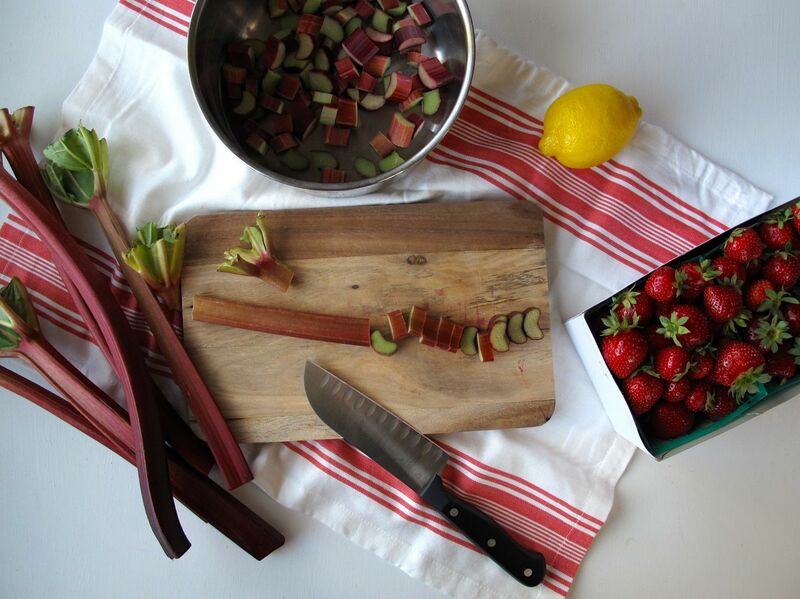 :) Me too; I can never get enough rhubarb (especially because it’s weirdly tricky to find in California compared to in the midwest where I’m from). Definitely a lovely way to spruce up your morning routine! How delicious. Wonderful idea and I love the idea of the almond butter! 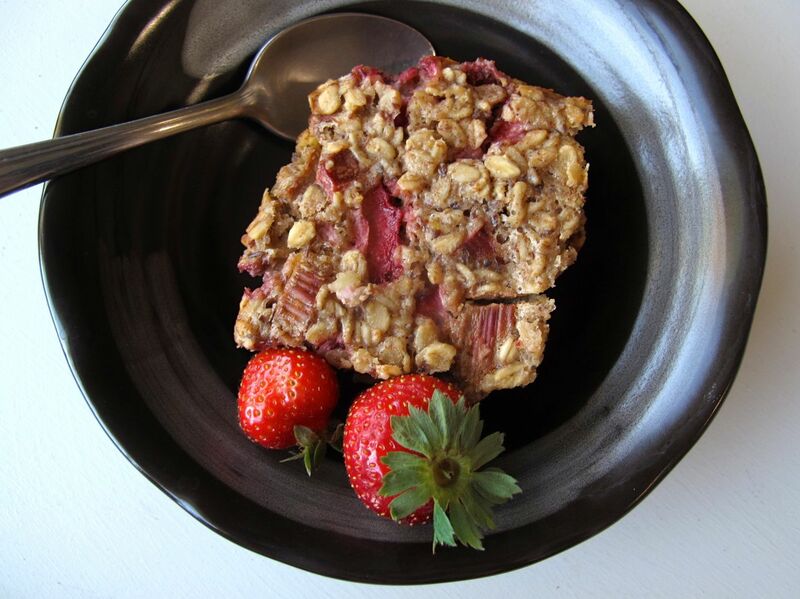 Rhubarb is my favorite, too! Thanks! 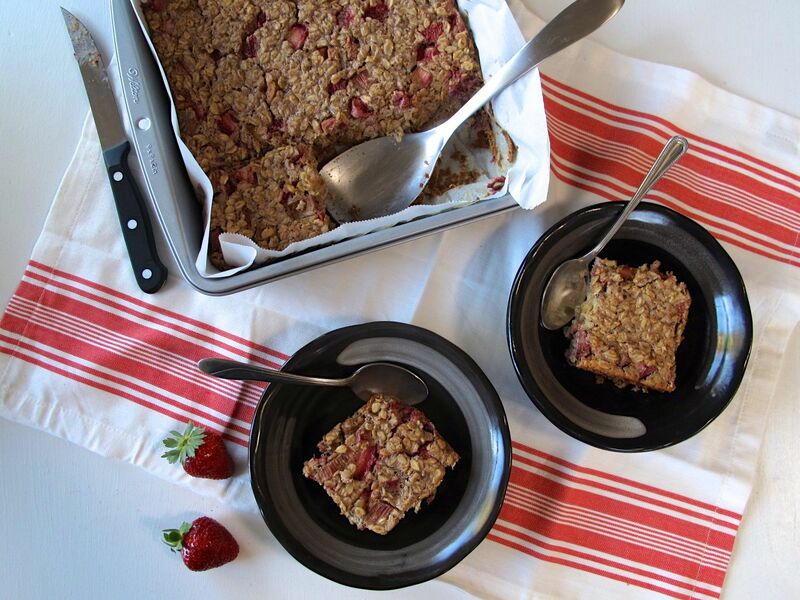 The almond butter is great in this — it makes it a lot more filling, but also goes really well with every fruit we’ve tried baking into this, especially berries and apple. I have not used this combo in baked oatmeal. 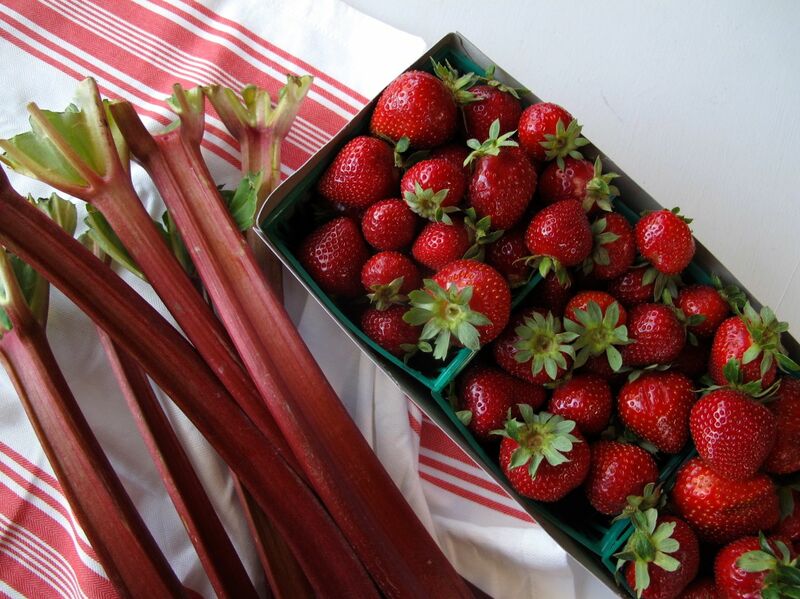 Sounds great to me and I did get a big bunch of Rhubarb from a neighbor and harvested some strawberries this morning. Thanks for the inspiration. Nice! You’re welcome — thanks for commenting. :) That’s so cool you have rhubarb and strawberries growing nearby, and, from what it sounds like, a very generous neighbor! 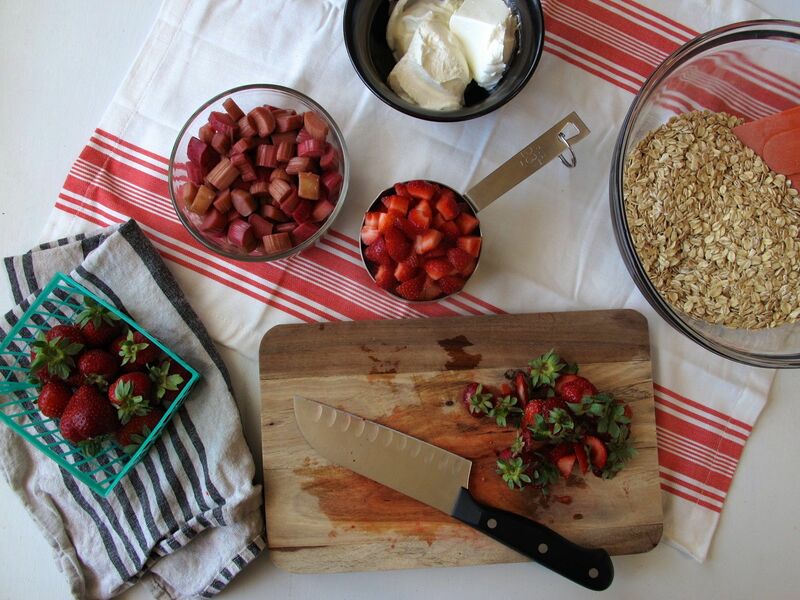 Rhubarb is so underused in California. I feel like it’s pretty rare to see it in grocery stores, but it’s so delicious! I love this idea. I’ve been eating scrambled egg whites and plain oatmeals for the past two weeks. I need to switch it up for sure. i totally hear you about variety: for me, it’s two eggs for breakfast every day. and that’s great…until it’s not. and then i cave and want a donut and that ruins the entire day, because it’s a donut, so then it’s back to eggs. I used to have two eggs (in the form of huevos rancheros… i.e., + two tortillas) every morning for breakfast, and now we often have fried eggs & (avocado) toast on the weekends, but I feel better about cutting back a bit on eggs (slash saving them for put-an-egg-on-it weeknight dinners) and getting more variety into my breakfasts. I’m not going to lie, though — the oatmeal does sometimes get boring by day 4 or 5, but then we change up the fruit again for the following week, or we use the baked oatmeal as an every-other-week kind of strategy — so worth it for the extra sleep each morning! I will definitely have to try this. It looks amazing!